We have exciting news! 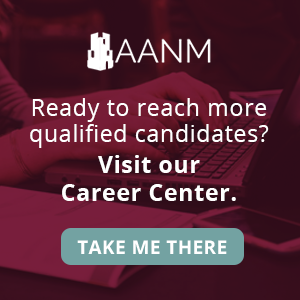 The AANM Career Center now offers a seamless sign on with your existing membership credentials. To access the career center, you can now log in with your AANM username and password. By doing so, you gain direct access to discounted member pricing without any hassle! Your previous account activity was all transferred over as long as you previously registered on our career center with the same email address you use for AANM membership. Sign in today and post your open jobs to find talented applicants quickly and more efficiently. Questions? Give the career center a call at (866) 842-7842 or send a message here.